First, children have a natural ability to play from a very early age. They are able to express their thoughts, feelings and experiences in therapy with play. This method of expression is a useful tool for children aged 3 to 12 years as developmentally they have not acquired adult language. Play in the therapy room is very different to play in the backyard or in the football match. Second, clients can choose what resources they want to use. The therapist accepts the child the way they are and embraces the child's play as a very unique part of their 'offering'. 'When kids come into the playroom, they set the therapist up to feel how they feel'. 'If a child feels anxious, the therapist and the toys will be set up to feel what it's like to be anxious', p.51, Lisa Dion. Third, the relationship between the child and the therapist is the core of the therapeutic process. When the child feels that the relationship is safe enough, emotional states or enactments that the child finds challenging, enter the play. 'The therapist is then able to modulate the intensity of these feelings...',p. 55, and teach the child how to move through such states. Through this process the child develops resilience in learning how to cope with emotions and experiences they once found scary or uncomfortable. Fourth, intense moments of interaction between the child and the therapist develop in therapeutic play. The child is able to observe and experience how the therapist copes with anxiety or disappointment or sadness. In this state of trusting attunement, the therapist takes the opportunity to teach the child positive ways of coping. Fifth, when the child has grown beyond their difficulties, they create play that is significantly different to the offering that they initially presented. The relationship between the therapist and the child has changed. 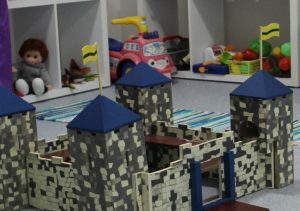 The child has learnt to make their own decisions with confidence and pragmatism and is ready to face new age-appropriate challenges with skills they have learnt in the playroom. Reference: 'Integrating Extremes'. 2015. Lisa Dion. Aviva Publishing. New York.